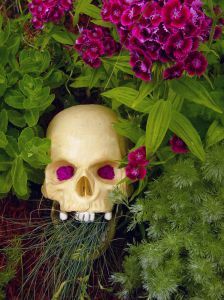 I just came in from doing some “gardening”, and by that I mean, I just pulled out some thigh-high weeds and threw out a decimated hanging basket. Saying that I’m not much of a green thumb is an affront to the color green and thumbs everywhere. I kill cactus, people. Like, regularly. When we bought our house seven years ago, our predecessors left us a lush oasis of emerald lawns, towering sunflowers and fragrant rosebushes. Prior to this, we’d only lived in apartments, so gardening was as foreign to me as size 4 jeans. Having a baby right after moving in, we could only focus on one living thing at a time, so the garden was left relatively untouched. My neighbor had to inform me, towards the end of the first summer, that the assemblage of beautiful wildflowers running along the side of my house was, in fact, a smorgasbord of weeds. In the last few years I’ve tried to rectify this sad situation: we’ve hired a lawn dude to deal with the plethora of dandelions and clover; I invested in gardening tools to help me pull weeds (although, in my zealously, the sunflowers accidently met an untimely end); and, we even bought a sprinkler (full disclosure: the boy was two-years-old). I recently attempted some landscape artistry with a bush (shrub?) thing and decorative stone plaque. I thought it looked spectacular. My friend assumed it was a commemorative gravesite for our dead cat. I still don’t know the difference between seeds and bulbs, annuals and perennials, or mulch and peat moss. What I do know are my limitations and disinterest in all of the above. My husband can’t understand why it’s impossible for me to keep a few measly plants alive for a couple of months. I tell him it’s the same reason he can’t manage to put a new roll of toilet paper on the holder – there is zero appeal, little will and absolutely no way. We bought 40 acres in the country from a couple we’ve known for years. Meanwhile, they built a house on their other tract of 40 acres–directly across from us. She had flower beds that were full of butterflies, 7 rose bushes, and a lilac. And I cringed. I work 40+ hrs a week, plus a daily commute of 1 hr each way. She on the other hand was a stay-at-home grandma that watched her grandkids 2-3 times a week. So not only did I let the flower bed get overrun with weeds, she got to watch. I can only imagine her cringing each time she seen it. When we built a new house in the same place as the old, I dismantled it, leaving only the bushes that I hadn’t managed to kill. The next time your neighbor is critical of your ‘weeds’ tell her the definition of a weed is just something you (she) don’t want….and you want YOUR dandelions and clover to feed all the lovely honeybees in the world! And when you say the phrase, ‘all the lovely honeybees’, you must do it in a saccharin sing-songie voice. Not too up you on neighbors but…..
My next door neighbor is a Pentecostal Neo-Conservative veteran with three brain trauma injuries. FYI-I have different religious and political views from him. He posts huge political signs up that say things like, ‘Where’s his birth certificate’, and ‘Hillary Clinton is evil’. Luckily his spelling is atrocious and so I get to laugh every time I pass his house to reach my drive! I guess I’m a bit envious that your neighbor is just critical of your flowers (not weeds!). And I LOVE the honeybees thing – totally gonna use that – thanks! Please. My neighbor bought me a beautiful hanging plant, which I have since managed to reduce to a shell of its former self. I forget to water it regularly and I don’t have the patience to snip off millions of dead flowers so new buds will appear. Hers are lush and full. Mine is scraggly and lank. It’s embarrassing. I didn’t even know you were supposed to get off the dead flowers until I caught the neighbour doing it for us one day! Love the comparison to the roll of toilet paper. You hit the nail on the head! I have a hard time with plants too… my mom works her magic on plants everywhere. She’s been with me for 2 weeks and all the brown in the plants in my house is now green. Everything is growing. Can’t figure it out! Please send her my way. Seriously. You tell your husband that you are a woman of the new millenium and that your life doesn’t revolve around making other things or people beautiful. Your job is to be fabulous. Period. End of story. V&GB – I am totally buying what you’re selling! Hmmm. Are you living my parallel existence? I am slowly learning about the world of greenery from my mother-in-law who has the greenest thumb of anyone I have ever met. I am her pathetic project. I am using this year’s pregnancy as an excuse to not fully cultivate my “garden”. I have managed to keep the gerbras alive though. Okay, if I am telling the truth it is my 3.5 year old son who remembers to dead-head them but I finally get the whole watering thing. It’s a start. Just don’t look at the balding back lawn. Your MIL could make a killing by renting out her services. Seriously. Have her call me. Hilarious, I can totally relate. I live in Florida so my backyard is akin to an apocalyptic wasteland. I’m only partially clueless when it comes to gardening which is to say that I do occasionally look at the little plastic card poked into the flower pot at Lowes. Fact is though, it just doesn’t matter, it just doesn’t matter. Everybody… it just doesn’t matter! The term “full sun” simply doesn’t apply to Florida. A plant, tree or bush may thrive in said full sun in 49 other states but die a horrible nuclear death here in the land of Mickey Mouse and Melanoma. The soil here in Florida is gumbo of sand, shells and broken beer bottles… okay, that last one might be exclusive to my yard. Oh, and just for the record, you had me at “thigh-high” lol. Keep up the great writing! What a great laugh!!! Thanks for sharing, definitely made a nice start to my evening. Thanks, Sarah – your blog is great! While I eventually turned into quite the gardener i won’t lie to you – I killed a lot of plants, grass and even small trees before I figured out what I was doing. The most important lesson I learned was the ‘happy accident’ lesson. Planned gardens can be very beautiful, but they can be an awful lot of work. For this reason, I developed my happy accident method. Take stone, or other object suitable for throwing and throw it. Walk to said thrown object and plant plant there. OMG – best advice I’ve ever received! I’ll start chucking stuff tomorrow…the summer ain’t over yet! Wow, we REALLY are twins! I kill cactus too and initially I thought they were “unkillable”…or maybe they were until I entered the picture. My husband tries to discourage me from any new plants…even fake ones. He thinks I can’t handle it, but I still have hope (sorta).